The often mythologized “small town America living” can be suffocating. The idea that everywhere you go, you end up running into someone you know, and that particular someone knows you too, gives a person living in a small town very little room to develop or hide or recreate. You end up being the person you’ve always been in everyone else’s eyes. Any attempt to step outside of the box that others have put you in is hamstrung the moment the stride begins. Small towns all across America also mask as many human horrors as any urban setting can conjure, and the idealized safety they supposedly engender only makes the realization of this horror all that more powerful. 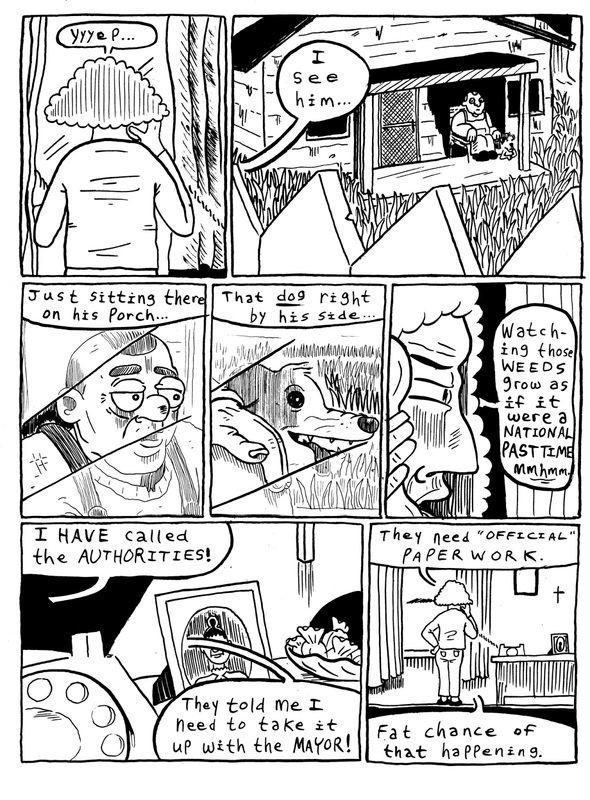 Such is the stuff of great swaths of American artistic endeavor. From Sherwood Anderson’s Winesburg, Ohio to David Lynch’s Blue Velvet to Grant Wood’s American Gothic to David Baker’s “The Truth about Small Towns” to the comics of Nick Drnaso, these explorations of the unsettling underbelly of small town life tend to deliver a larger truth about the hopes and dreams of people in general, but Americans in particular. When an artist delves into the mythologies of a society and lays bare the truth about its inherent ugliness, their art becomes political as much as it is an exercise in either aesthetics or emotional understanding. 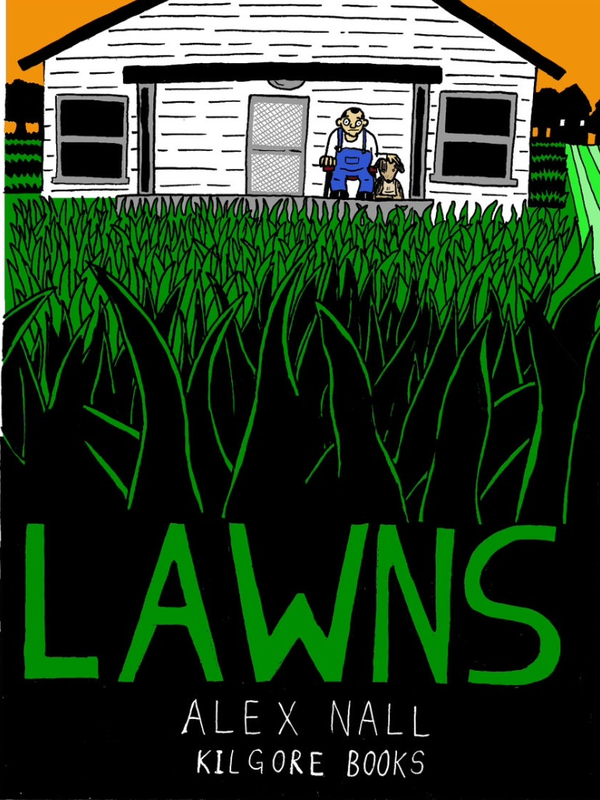 So it is with Alex Nall’s newest comic, LAWNS, published by Kilgore Books. The blurb on the back of Lawns reads, “Lawns is the story of a small town mayoral election gone awry. As public tension mounts over the strange behavior of one of its citizens, the town's prejudices, fears, and hidden pasts are revealed to showcase an American landscape that may be all too familiar”. 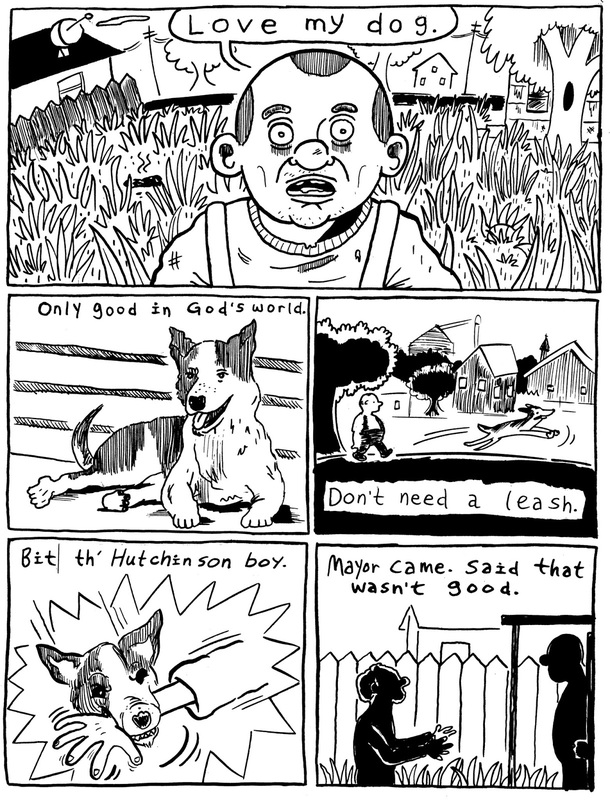 In 108 pages of black and white cartooning, Nall explores issues surrounding rural living. Poverty and economic collapse are at the center of this exploration, but Nall expands out into issues of abuse, power, mental health, and isolation -- each circle forming a rippling Venn Diagram that is the constant truth of modern America. As wealth and power congeal in the hands of the few, huge parts of the country are left scratching its head and stabbing fingers of unfocused anger into the faces of anyone less powerful than they. Capitalism feeds upon its underclass, churning it up like chum in a shark tank while distracting it with false dreams of social mobility, the comforts of the aesthetics of conformity, and the shiny allure of gimcracks and gewgaws. There is, therefore, a certain nobility to the individual who refuses to mow his or her lawn. 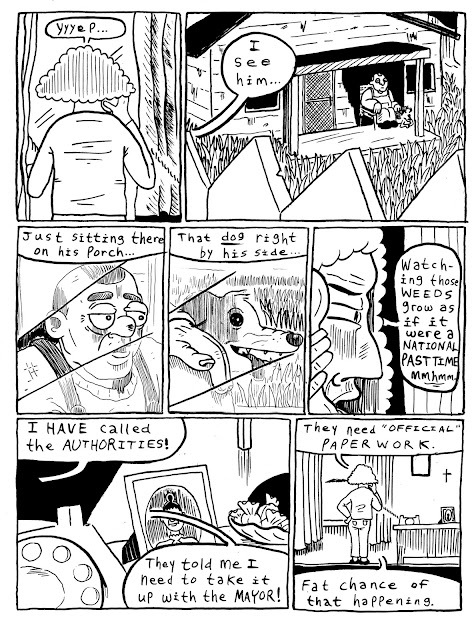 There is, perhaps, a certain dignity in the act of letting one’s dog run free in the woods. To step out of the expected flow of behavior in an existence that prospers through acquiescence is nothing if not a political act. The ramifications for doing so can be ostracising or even dangerous, especially in a small town where the dictates of compliance are drawn in the same ink as the boundaries on the map. 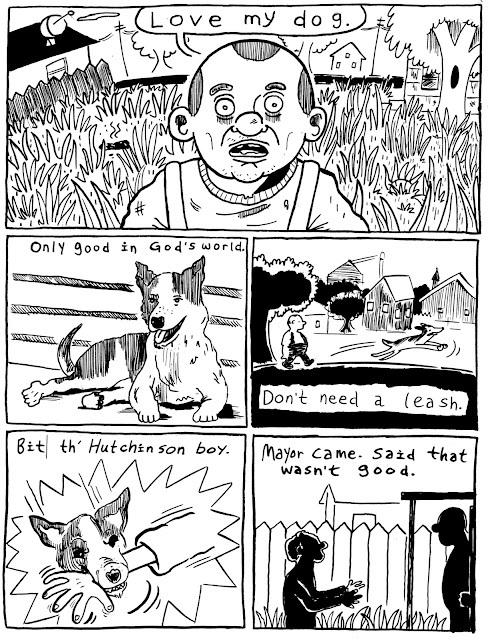 In Lawns, Nall lets all this unfold through simultaneous narratives and an open cartooning style that relies on negative space to create tension and timing. As corporate engineered divisiveness seems to be the status quo in an ever-diminishing America, Alex Nall’s voice is almost a mirror reflecting upon itself, a diatribe in a language so familiar it almost ceases to be understood. And yet, in a country where red hats glare at rainbow flags and the dominant culture sees itself under attack while perpetuating the very system that keeps it in power, Nall’s becomes a voice that deserves amplification, if only to maybe be heard above the screams of a country in the midst of stabbing itself in its heart.